From the studio that last year brought you Dark Shadows, Snow White and the Huntsman and other monstrosities comes Jack the Giant Slayer, another effects-driven behemoth that buries its human elements beneath the shiny stuff that kids like. The film was marketed as an “adult” take at the Jack and the Beanstalk legend. If that’s what they were going for, something got very lost along the way. This is more of a theme-park ride than a movie – and not a particularly thrilling one at that. There is virtually nothing for an adult to relate to in the story. Meanwhile, it is likely too intense for small children. “Let’s just release it in March and hope no one notices,” said the other. Among the film’s many flaws is a basic misunderstanding of how crucial the element of surprise is in storytelling. This type of miscue pops up throughout the film, but the first and worst offender comes in the opening sequence. We meet our two heroes as children, a young boy and a young girl, whose parents tell them the famous legend of Jack and the Beanstalk. As we flip back and forth between the two scenes – one in a kingdom, another in a poor, country home – we understand how shared culture can strengthen the bonds between people from disparate economic backgrounds. It’s a lovely point, but it comes at some cost: the story the parents tell their children – of giants who come down from the heavens to wreak havoc on the humans – mirrors precisely the film we are about to see. As such, we know all the major plot points before they happen. From there, we enter the well-worn territory of the fable. The boy grows up into Jack (Nicholas Hoult), a teenage romantic who, on an ill-fated trip to town, sells his horse for some magic beans. While he is in town, he falls in love with a girl who he soon learns is actually the princess, disguising herself for a visit with the commoners. Later, when she escapes the castle and gets caught in a rainstorm, she propitiously ends up taking shelter at young Jack’s home. The rainstorm creates an opportunity for Jack to spend some quality time with his forbidden love, it also causes some significant problems. Like the Gremlins, the magic beans sprout only when they get wet, and soon a giant, CGI beanstalk has sprouted in the middle of his home. The princess is lifted away. A rescue mission is launched, and Jack joins a team that includes the king’s best soldier, Elmont (Ewan McGregor); his trusty sidekick, Crawe (Eddie Marsan); as well as the king’s right-hand man, Roderick (Stanley Tucci), who is also betrothed to the princess. A splendid supporting cast, to be sure, but their talents cannot transcend the lazy screenplay. The heroes – Elmont and Craw – are given precious little characterization, and Roderick would be a passable villain if there were any element of surprise to him. Instead, the filmmakers clue us in to his dastardly ways far too early in the proceedings. Nearly every actor gets dragged down by the material, except for McGregor, who continues to earn my respect for emerging unscathed from dreadful films. And then there is Hoult. I’ve got a soft spot in my heart for the actor who played the sad, awkward adolescent in About a Boy. But the older he gets, the more personality he seems to shed. Granted, there is little on the page for him to work with, but a good actor can make a lot out of a little. 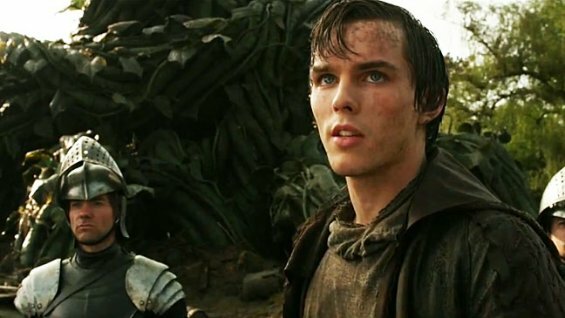 Jack portends bad things for Hoult’s career as an adult actor, and it is perhaps no coincidence that he effectively played a zombie in the recent hit Warm Bodies. I’d say he is in danger of being typecast. Jack the Giant Slayer is not just your run-of-the-mill bad film. Its failures are accentuated because you can see glimpses of the better, more serious film buried beneath the spectacle. When the giants are first introduced – and they are impressively rendered – it seemed that perhaps they would not be depicted as purely evil, rather just as another species trying to survive. That scene finds Elmont and the gang trying to catch and eat a sheep to quell their hunger, but instead they nearly end up a main course for the giants – a nice ironic twist that could have, in a more serious movie, lent itself to a comment on the value of having empathy for our enemies. The filmmakers event went so far as to hire an actual actor – the great Bill Nighy, who played the aging rock star in Love, Actually – to play the lead giant, intimating that they were interested not just in his frightening, CGI-enhanced appearance, but in his character. But eventually Singer and his effects team succumb to their anthropocentrism, and the giants are reduced to evil, bloodthirsty monsters who enjoy torturing humans while they’re not picking their boogers and eating them (seriously). A simplistic battle between good and evil is not problematic as a plot device, but we have to care about the “good” characters to make it work. Storytelling is not rocket science; more like a collection of time-tested recipes. Give us some relatable characters, a sensible plot, and a few believable twists along the way, and we’ll go along for the ride. We’ll even tell our friends. It amazes me that Hollywood continues to screw this formula up. Jack the Giant Slayer is a prime example of the industry’s all-too-common failures, although it doesn’t seem to know it. The final scene offers a twist that brings the story to modern-day London. It seems the producers thought that a sequel would be in the works. I’m not so sure. Still, the idea of a race of giants battling humans in the streets of London…I’m already more interested in that than I was in this film. Too bad we’ll never get a chance to see it.